A long history of returns. Investing isn't easy. Even Warren Buffett councils that most investors should invest in a low-cost index like the S&P 500. That way, "you'll be buying into a wonderful industry, which in effect is all of American industry," he says. But there are, of course, companies whose long-term fortunes differ substantially from the index. In this series, we look at how members of the S&P 500 have performed compared with the index itself. Step on up, Boeing (NYSE: BA). Since 1980, Boeing shares returned an average of 11.6% a year, compared with 11.1% a year for the S&P (both include dividends). Even that small difference adds up. One thousand dollars invested in the S&P in 1980 would be worth $29,400 today. In Boeing, it'd be worth $33,200. Dividends accounted for a lot of those gains. 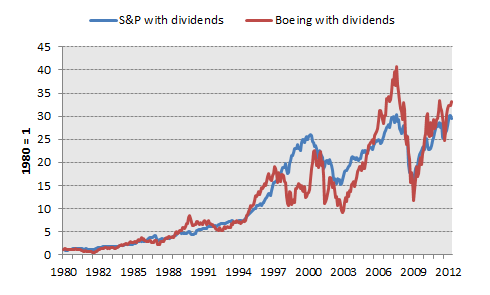 Compounded since 1980, dividends have made up 54% of Boeing's total returns. For the S&P, dividends account for 41.5% of total returns. Fairly significant outperformance. Since 1995, Boeing's earnings per share have grown by an average of 8.1% a year, compared with 6% a year for the broader index. That's testament to global growth, its economies of scale, and operating in an industry with a virtual duopoly. That earnings-growth dynamic has led to above-average valuations. 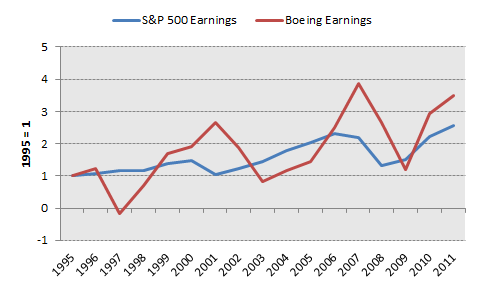 Boeing has traded for an average of 28.3 times earnings since 1980, compared with 21.3 times for the S&P. The company has been, clearly, an above-average performer historically. The question is whether that can continue. That's where you come in. Our CAPS community currently ranks Boeing with a four-star rating (out of five). Do you disagree? Leave your thoughts in the comment section below, or add Boeing to My Watchlist.